Discussion in 'Muppet Headlines' started by GelflingWaldo, Mar 13, 2008. Variety is reporting that Disney has just signed a deal with Jason Segel and Nick Stoller to help create the next Muppet movie. 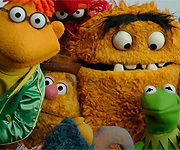 According to reports, Segel and Stoller will write the script while Stoller will direct the proposed Muppet film. This project is very much in its infancy and is still a long way off, but I will be sure to keep you up to date as soon as more information on this project becomes available. It will probally take a year or two until we see it (they still have to write it, you know) - but I have been told by several people at Disney that the hope is to get the Muppet back to the big screen before the end of the decade (2010). Thanks again Greg (just posted over at the Flash). It is an exciting development. I see now that Muppets.com XD is Disney's way of drumming up viewer support without having to create a television series yet. Smart thinking. The content gives me confidence that the Mouse is getting to know the Muppet characters and humor much better than before. There is a Disney Store in San Francisco's Union Square that has a billboard atop its structure that is updated with Disney movie and channel related promotion (not necessarily related to the store itself). I have always hoped to see the froggy eyes peeping down at me from up there. Maybe in a couple years. I never heard of Jason Segel and not a big fan of most of the things on his list but am a fan of the stuff on Nick Stoller's list. Either way a new Muppet movie is amazing news! And I can not wait till the ball starts rolling, could a tv show be far behind now? Did anyone check out the IMDB profiles of these two? This is who Disney tapped? Im just saying...what happened to the script Brian Henson and Bill Baretta were writing? If anyone knows the Muppets more. Heck, whose writing the Muppets.com scripts/ideas? I could see this team writing a romantic comedy script starring say, Pepe and a human actress; or a pg-13 film about a group of Muppets living in a college dorm. But a main Muppets film? These are no doubt two great guys, but is this the perfect duo for the next Muppets feature film? Do they know the chemistry and subtle nuances? I wish it coulda been Brian Henson/Baretta's script with say, Spike Jonze or Michel Gondry directing. This is exciting, but I'll believe it when I see it. There's been so many announced projects that have been cancled, both in the Henson era and the Disney era. this could be good though, they the two Disny has sigined to write and direct could work, and give the Muppets there edge they need. 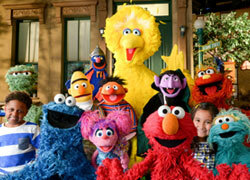 But if this is who it takes to get another Muppet movie. My response is it better be good. As long as it's not any more Simpsons writers. Just kidding. If they have passion to write for the muppets, and a working knowledge of their chemestry, and can find a great vehicle for them, that'd be great. If 2 years down the road, we're seeing a project called "Muppet Bonfire of the Vanities" then we have to worry. I hope it's an ORIGINAL storyline this time. No more book movies. And I hope this is an actual movie, even if it's DTV or a telefilm. I loved VMX, but it hardly seemed like a movie, but rather a 2 hour Tv special. According to the article, Segel pitched Disney a concept so it must be pretty strong for the Disney brass to greenlight the writing of the script. I don't care if who's writing the script as long as it's good. I don't think Disney was in any hurry to do a major Muppet project, so the idea that they are showing enthusiasm may say wonders about the concept. Honestly, I'd be happier to see someone new have a chance rather than turning them back over to the folks that brought us the fabulous MWOZ. And let's remember too, this is a new regime at Disney. My hopes are that Lasseter may even have some say in the script of something like a new Muppet movie (even though it's not animation). This is incredible news and I am just overjoyed. Beaming as I type this, I am starting to think something positive is going to come from all this waiting. Even if it is just a possibility! Hope, hope, and more hope! : Did somebody say bang? YAAAAY! It's something! I do hope this is good stuff. Can't wait to see what happens down the line concerning this new movie however. "The Frog & the Hound"
"The Frog Prince 2: Taminella's Revenge"
"Brother Bear 2: Fozzie Checks In"
Heh you get the idea of what I don't want to see Disney do. Meh... I'm excited for the possibilities, but also nervous. I'm just not sure the Disney brass really understands the Muppets or what would constitute a *good* Muppet script. I think they know a lot about what constitutes a good "kid movie" script, and occasionally a good "family movie" script, but the great thing about the old school Muppets style (tv show and first three movies, at least) was that it was kid friendly while still maintaining a level of humor that was entertaining on an adult level, and not in a pandering sort of way. I have only loved one post-classic Muppet movie, which was MTI, and I'm not even sure it entirely fell in line with that older Muppet style. I worry that Disney skews a lot of their modern live-action entertainment towart the "'tween" audience. I just don't want to see a Muppet movie with cameos by Miley Cyrus, Raven, Zack & Cody, etc. But, regardless, I remain cautiously optimistic. Maybe these guys will have a better understanding of what the Muppets should be. Segel did "Forgetting Sarah Marshall" which hasn't been released yet. The buzz is that there is a puppet sequence and it sort of makes the film. Also, a lot of critics are liking the film. Disney has an incredible management team and i'm sure they are looking for a fresh spin as the Muppets so desperately need. I think Segel & etc. went into that meeting and knocked it out of the park and were hired on the spot... Those are all clear, great signs in Hollywood that they've got something! I was SO PSYCHED to hear this news, and I come here (I'm not REALLY supposed to forum-post at work) and so many people are already so worried about it. Be happy! The cup is half-full not half-empty! I know that you look at Jason Segel and see that he's one of the Apatow gang and get nervous, but does anyone here watch How I Met Your Mother? Jason plays Marshall, who is pretty much the sweetest character on tv today, and if you listen to the commentary you can see that Jason is just the same. Obviously "Sarah Marshall" humor is NOT Muppet humor, but it IS good enough for Apatow and studio execs and it predicted to be a big hit. So after this movie hits Jason will have a solid writing credit to his name--something that can only help the new Muppet movie if his name is attached. Another thing that makes me excited about it is that he approached Disney about it. They didn't court him. That's got to mean that (a) he's a Muppet fan, (b) he wants them to make a big comeback and (c) he believes in himself. I think it's an absolutely brilliant choice. He's old enough to remember/have experienced the Muppets at their classic best, but he's young enough that he knows what works today and, no offense to the wonderful people in the Muppet family, recently they haven't seemed to make the Muppets work for the new generation (coughMWoOcough). I think it could work wonderfully and---and this can only be a good thing--it puts attention back on the Muppets again! When "Sarah Marshall" is a big hit--and it will be--it'll be said that Jason Segel is currently working on __________, _________ and writing a new movie for the Muppets. So please, do not be so dismayed, people. Watch an episode of How I Met Your Mother (Seasons 1 & 2 available on DVD, yay!) and see the less-Apatowish side of Jason Segel. My recommendation would be "Slap Bet" or "Goodbye, Fiyero". PS: I can't wait to see the puppet Dracula scene in "Sarah Marshall"! Oh we're on the same page...but shouldn't some of the head Muppet veterans have a big helping hand with the writing? I'm seeing these Muppets.com new shorts and absolutely loving the chemistry...the Muppets don't feel like "old nostalgia", they feel current. I want someone to write from that standpoint without pandering to a nostaglic factor, while bringing back the classic heart-music-magic.